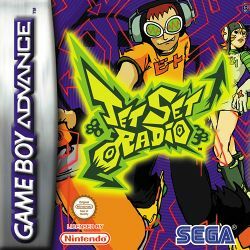 Jet Set Radio (ジェットセットラジオ Jetto Setto Rajio?, called Jet Grind Radio in North America) is a video game for the Dreamcast, developed by Smilebit and published by Sega on June 29, 2000 in Japan, October 30, 2000 in North America and November 24, 2000 in Europe. A version of the game by Vicarious Visions was released by THQ for the Game Boy Advance on June 26, 2003 in North America and February 20, 2004 in Europe. A HD version of the game by Blit Software was released for Xbox Live Arcade, PlayStation Network and Windows in September 2012. Its sequel, Jet Set Radio Future, was released in 2002 for the Xbox after Sega became a software-based company. The game is also known for spearheading the use of cel-shaded graphics in video games. This page was last edited on 30 May 2016, at 05:33.